A pretty lousy battle movie that is weak on story as it drags on and on. Kingdom of Heaven is a Ridley Scott battle movie, and last time I checked, scott was the leading authority on medieval battle movies, much like Kenneth branagh is the authority on Shakespeare. so, why is this movie so bad? first of all, let’s examine the possibility that scott is not so great himself, but is only great when working with his number one leading man, Russell Crowe. yes, this sounds ridiculous, but why then are his movies with crowe so much better than everything else he does? Gladiator, Body Of Lies, American Gangster, and even Robin Hood, were probably his four best movies of the last ten or so years. Yes, a long long time ago (over two decades ago), this guy turned out some classic films like the original Alien movie and blade runner, but more recently his best movie has been gladiator (which is good, but not great), and then American Gangster after that. and the reality is, scott is not a great director. not like he used to be. Up until Kingdom of Heaven, however, i believed that he had a mastery of battle movies. not so. coming out two years after the final lord of the rings movie, the return of the king, this film offers nothing new in the ways of knights and castle warfare. that’s because the return of the king already stole it’s thunder. that movie, third and weakest in the trilogy, made some serious mistakes, but when it came to battle sequences, it held nothing back. from flying beasts attacking the castle, to catapults launching boulders, to giant battering rams, to horses with soldiers on them, running right over the enemies, that movie had it all. even giant elephants covered in battle armor let loose. Kingdom of Heaven can’t compete. yes, it brings in giant catapults. we’ve already seen it. and yes, it has men inside those tall catapults who drop drawbridges out of them and onto the roof of the castle and then run out onto the roof to fight. we’ve already seen that too. even setting the giant stones that the catapults are launching on fire isn’t enough to really grab our attention. are we a tough audience? you betcha. but that’s why the best movies know that to impress us they need to come up with something we haven’t seen before. getting away from all of the battle stuff for a moment, the plot of the movie is weak and confusing. it starts off strong enough with orlando bloom playing balian, a blacksmith in france whose wife has just committed suicide. a local priest (michael sheen) order her beheaded and then takes her cross necklace from off of her neck. at the same time as this is happening, some crusaders returning from the holy land of jerusalem come to see balian and ask him to join them. 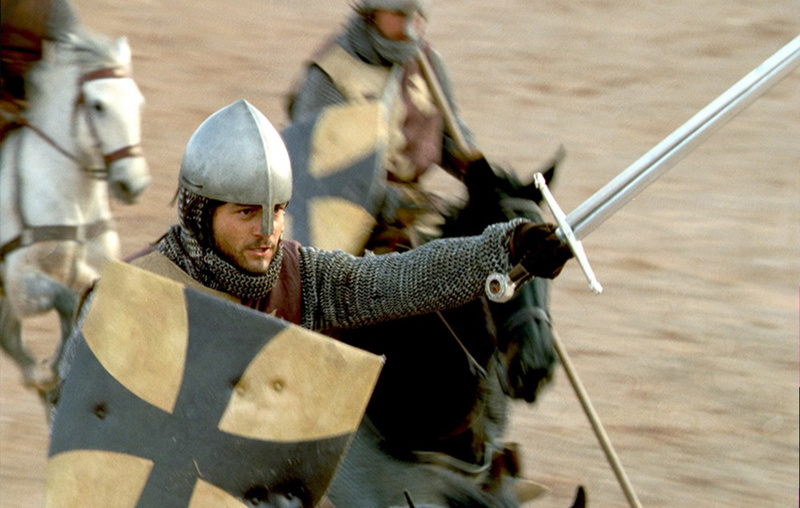 the leader of the crusaders is godfrey, played by the great liam neeson. godfrey is balian’s father. the two of them have never met, but godfrey introduces himself now, claiming that his son is destined for a life better than this. balian says that his place is here in france where he can say goodbye to his dead wife and the child she had lost before taking her own life as well. and so godfrey and his knights go on their way. that’s when the priest who ordered balian’s wife beheaded comes to visit him. he wants balian to go with the crusaders and tells him of how his wife is in hell for taking her own life. he tells of the beheading and when balien notices the cross around his neck that belonged to his wife, it is too much. he kills the priest, tosses him into the fire, and runs off to catch up with the crusaders. all of this is great. it’s also the first ten minutes of the movie. there’s a reason why i talk about it in such great detail and that’s because it is by far the most interesting material that happens in the entire film. balian meets up with his father who trains him a little bit in how to use a sword. when men come to arrest balian for killing the priest, a fight breaks out and godfrey is killed. the knights ride off and balian is now left to go to jerusalem on his own. bailian boards a ship, the ship Crashes, and he finds himself washed up on a beach all by himself. he’s the only survivor of the wreckage. him and a horse. two men approach him, wanting to take the horse. one of them challenges him to a sword fight. they fight, balian wins, and the final semi-interesting scene of the movie is now over. from this point on, and basically as soon as he enters jerusalem, the movie just becomes more and more lifeless. funny, because none of the big battle scenes have even happened yet. a major problem with the movie is that the plot is incredibly confusing. there are too many names and armies and interests at work here and it is very difficult to keep track of all of them. especially when half of them are betraying the others. there’s jeremy irons as tiberius. he’s got some sort of a quarrel with brendan gleeson’s bearded red head character who is some sort of a troublemaker and instigator. that character has been savage to muslims and ordered their deaths, only tiberius cannot prove that gleeson was behind the commands. there’s also a king who is a leper and wears a mask and gloves to hide his deformities. he’s played by edward norton, although we never see the actor’s face, and can only just make out his voice. then there’s the king’s sister, played by eva green (casino royale), who has eyes for balian. she’s married though and the man she is married to is supposedly evil. what a cliche. this man is poised to take over the throne as soon as norton passes away. none of this is very interesting. especially when surrounded by lengthy and dull conversation scenes. and the action is hardly great either. i’m not even sure if the villain of the movie is any of these characters or if it’s the muslim ruler who leads the army that the big climactic fight is against at the end of the movie. and i’m not sure if i really care. 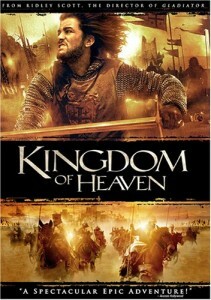 Kingdom of Heaven is way too long and way to complex. and it seems like the plot is made extra complicated on purpose, as if confusing us will make us think it is that much more deep and interesting. the truth is this is the exact opposite of how to make an enjoyable film. the movie starts off with real promise and potential, but pretty much when liam neeson dies, the energy of the movie dies as well. it’s a lousy movie with an annoying plot and nothing new to offer in the ways of action.